Pictured: Standing – John Smith, Colleen Carew, Clover Carroll, Bevin Cetta Boisvert, Gene Locke, Terri Miyamoto, Teri Kostiw, Joe Abbate, Mike Fox, Robert Kavanaugh. Front Row – Linda McNeil, Ellen Groth, Allen Hale, David Miyamoto. Not pictured: Bob Dombrowe, Tom Guterbock, Steve Kostiw. On Saturday, December 3, and Saturday, December 10, members of The Crozet Trails Crew assisted in clearing an area for The Blue Ridge Tunnel Foundation where a fence will be constructed. The fence will prevent access to the current active train tracks which run beside the new access path to the Tunnel. Allen Hale, President of the Blue Ridge Tunnel Foundation and Nelson County Supervisor, along with Bob Dombrowe, Tunnel Board member and Crozet Trails Crew Vice President, spearheaded the workdays in an effort to reduce costs associated with the fence installation. The group cleared brush and removed trees blocking the pathway as well as removing trash from the site. 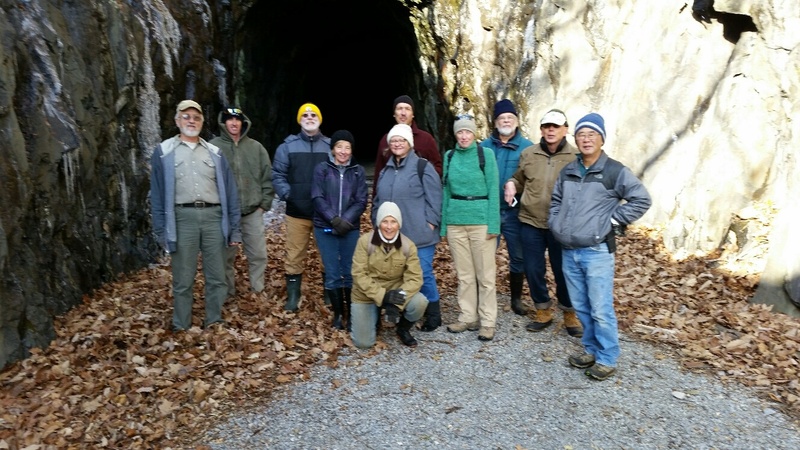 Following the completion of this work, The Trails Crew members were given a personal tour of the Nelson County portion of the tunnel as a thank you for their efforts. The tours of the Eastern Portal have proven very popular and when offered are sold out very quickly so the Crew appreciated this special opportunity.